Microdermbrasion scrubs exfoliate the skin. They remove dead skin cells from the surface of the skin, helping to reveal younger skin below. They also smooth uneven areas, helping to promote clear, healthy skin. Store-bought microdermabrasion scrubs contain micro-crystals which are made from pearls, aluminum oxide, magnesium and sodium bicarbonate. Unfortunately, micro-crystals are only available for purchase to doctors and skincare professionals. 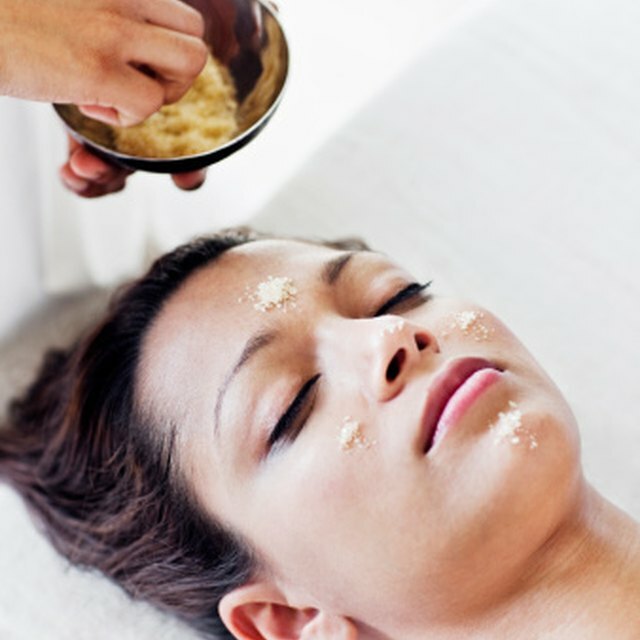 You can, however, make a homemade microdermabrasion scrub, substituting similar ingredients for micro-crystals. Place 4 tbsp. of sugar into a blender. The sugar granules will exfoliate the skin, removing dead skin cells from the surface. For a gentle microdermabrasion scrub, opt for very finely ground sugar. If you'll be using the scrub on rough areas of skin, such as the feet or elbow, you can use standard ground sugar. Add 4 tbsp. of powdered milk to the blender. Milk is a good ingredient for exfoliation due to the natural alpha-hydroxy acids it contains. Pour 1 tbsp. of olive oil into the blender. Olive oil is richly hydrating and will help to nourish skin. Put 1 tbsp. of honey into the blender. Honey absorbs bacteria and impurities from the skin, encouraging clear skin. It is also very moisturizing, keeping skin supple during the exfoliation process. Blend the ingredients thoroughly. Your microdermabrasion scrub is now ready for use. Wet skin thoroughly before applying the microdermabrasion scrub to it. Work the microdermabrasion scrub over your skin, using circular motions and even pressure. Use the scrub two to three times weekly to keep skin soft and refreshed.